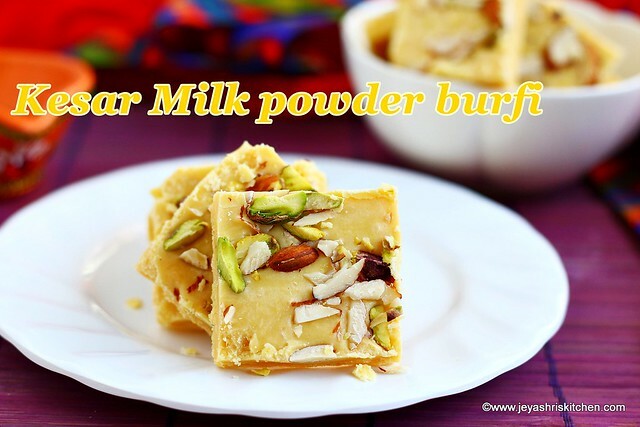 Milk powder Burfi|Kesar Milk powder burfi recipe with video. This recipe is made with milk powder, sugar and saffron as main ingredients. I have already posted Chocolate burfi, using milk powder. I just followed the same recipe by replacing chocolate powder with kesar|saffron. It turned out so well, to be more precise as similar to the Mithaiwala, milk sweets. Check out my milk powder Peda and Badam peda recipe. Check out my complete collection of Diwali recipes. In a heavy bottomed pan, add sugar. Add 1/4 cup water to this. Once the sugar is melted, wait for the sugar to form one string consistency. When you touch the sugar syrup and hold it in between your thumb and index fingers, it should form a firm one string. Check out my detailed post on one string consistency. Once the one string consistency is reached, add the milk powder, saffron soaked milk and butter. Mix it well and stir the mixture continuously. Stir well till the mixture reaches thick idli batter consistency. Keep a ghee greased plate ready. Once the milk powder mixture comes to idli batter consistency, transfer this to the greased plate. Sprinkle the chopped nuts on this and gently press with a spatula. Allow this to keep completely. 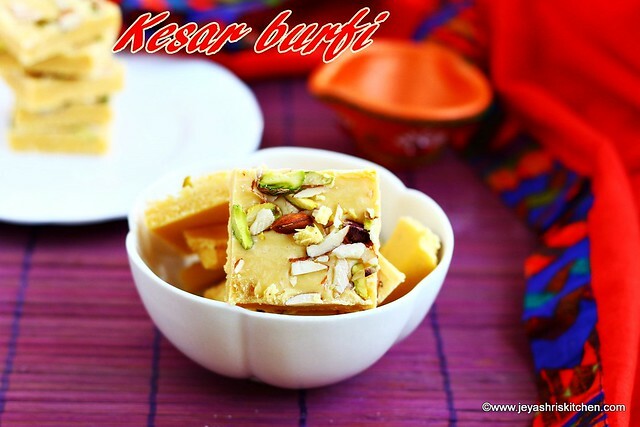 Enjoy the Kesar Milk powder burfi. This Kesar burfi stays good for 4-5 days in room temperature. Make sure to add milk powder after the one string consistency is reached. Else the burfi will not set properly and end up in fudge. You can add few drops of rose water to get a nice flavor. Do not forgot to switch off the flame after the milk powder gets nicely incorporated into the sugar syrup. You can add half portion of the nuts along with milk powder. I used Nestle, Nespray Everyday Brand milk powder. You can add 1-2 tblsp of desiccated coconut to the milk powder mixture to get an enhanced taste to the Kesar Milk powder burfi.